Bryan Hughes has always pegged himself as a people person, believing in the boundless benefits of sharing experiences and fostering connections. Always eager to add acquaintances, the resident of the 1100 block of South Eighth Street is hoping to exchange a few firm handshakes and solid groundstrokes Saturday when the South Philadelphia Tennis Association takes to Franklin Delano Roosevelt Park, Broad Street and Pattison Avenue, for the Summer Sizzler, the official kickoff of the entity’s relationship with the green space’s friends group. The Passyunk Square inhabitant relayed that friends group member Barbara Capozzi approached him about establishing programming in the expanse. As the overseer of a labor of love that has won Community Tennis Association of the Year honors through the United States Tennis Association (USTA), Hughes immediately gave consent and has proven a content partner through the Grow the Game outreach. 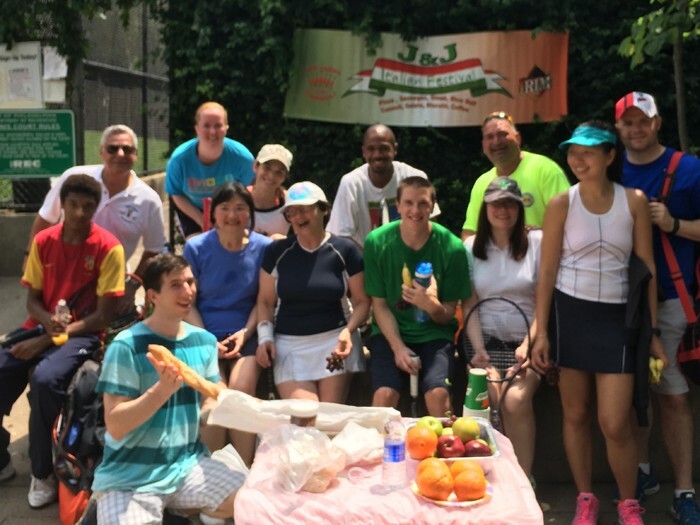 Having already commenced Tuesday and Thursday After Work Drill and Play sessions at the 102-year-old urban slice of heaven, he is using Saturday’s gathering as the declaration of the triumvirate that the association, the friends group, and the USTA have formed. Saturday’s participants in the $25 Adult Play Day Tournament will engage in three rounds of rotating mixed partner doubles action. Designed for players of all abilities, the 1–4 p.m. offering will also find Hughes furthering his reputation as a gregarious and giving guy through food and drink options, prizes, and giveaways. A visit to the South Philly Review’s website search engine reveals that Hughes has often appeared in the publication, most recently in March when he claimed the high school/youth coach Readers’ Choice Award. Time in Texas and Florida yielded amazing instructional opportunities, but no matter how appealing and successful his stints in other locations have been, South Philly will always loop a lasso around the native’s heart. Hughes noted that the initial programs through the new player initiative will look to be as inclusive as the South Philly Tennis Association’s ledger of endeavors has been. He expressed particular interest in drawing minorities and millenials, yet no matter one’s makeup, he feels the time to take up “the sport of a lifetime” is now. While Saturday’s focus will be on adults, younger enthusiasts’ racquets will not soon be collecting dust. Come Aug. 27, a Junior Play Day Summer Fiesta will include information on joining USTA Programs, notably the increasingly popular 10-and-under tennis format, and, on Sept. 17, Hughes and his colleagues will start their Junior Team Tennis slate, with tutelage for three different age groups. The 47-year-old intends to remain his customarily outgoing self in attracting curious locals to FDR’s courts, knowing that his decades of diligence as a practitioner and an encourager will always keep his spirits lightly strung. To register, call 215–528–0196, or visit meetup.com/SPTATennis or spta.usta.com.